Whey Protein and much more! Maxi-Health Research® is proud to provide you with our most advanced dietary supplement, Naturemax Energize™ - Creamy Vanilla. It’s professionally formulated to provide you with all the nutrients you need to stay healthy and fit. 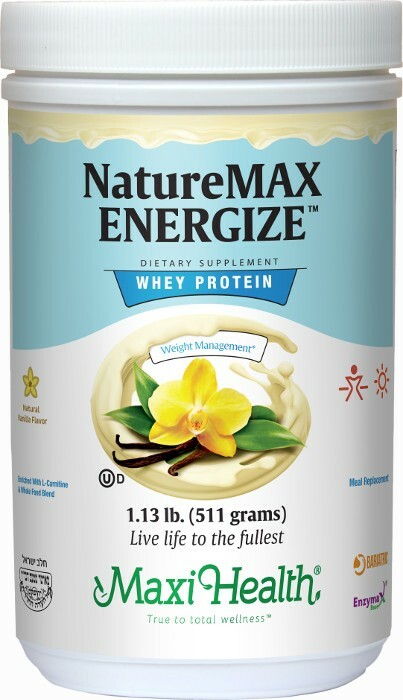 Naturemax Energize™ is a delicious natural vanilla drink enriched with easily digestible whey protein, fibers, enzymes, amino acids, vitamins, essential minerals and powerful antioxidants. * it is also available in three other natural, delicious flavors, chocolate, orange-vanilla and strawberry. Contains higher branched chain amino acids (BCAAs), the building blocks of skin, hair, nails, muscles, that help your body function normally, and even your immune system. Whey protein is especially beneficial for active lifestyles. Check out the supplement facts tab and see for yourself. Two servings of Naturemax Energize™ provides 40 grams of whey protein. Other Ingredients: Whey protein concentrate, maltodextrin, psyllium husk powder, guar gum, xanthan gum, natural flavor, monk fruit extract, lecithin (from sunflower), Stevia rebaudiana extract, silicon dioxide, inositol, L-Carnitine (50 mg), choline bitartrate, Earthrise® spirulina, apple pectin, citrus bioflavonoid complex, Enzymax® (calcium carbonate, bromelain, papain, lipase, amylase, protease, silica), papaya fruit powder, organic barley grass powder, organic wheat grass powder. This product contains NO wheat, yeast, salt, artificial flavors, or colorings. Earthrise® is a registered trademark of Earthrise Farms.